Changing the door sets on the doors in your home can make a beautiful design statement and is a reflection on the overall style of the home. Interior door sets come in three basic functions – privacy, passage, and dummy. Privacy door sets can be locked from the inside and locked from the outside by emergency key and are used primarily in bedrooms and bathrooms. Passage doors sets are operational from both sides and have no locking function. They are used for closets and hallway doors. Dummy doors sets have no mechanical latch mechanism. 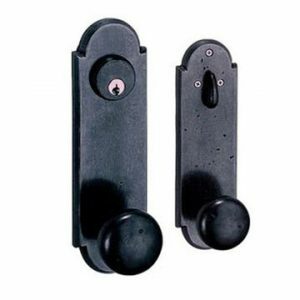 They are typically flush mounted with no mortise or hole cut in the door, but can be mounted on doors with predrilled holes. They are often used for closets, pantries, on interior double doors, and for decorative applications. Door sets come in a wide array of styles and finishes from rustic to contemporary and simple to ornate. 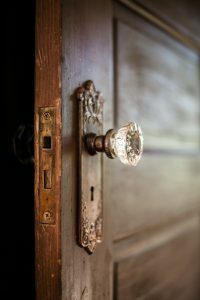 Door knob choices include lever, round, oval, octagonal, Prairie, New York, Victoria n, Mission, Arts and Craft, Art Deco, and more. Backplates also are available in many styles and shapes. Entry door sets lock from both sides using a key on the outside and a thumbturn on the inside. Locking entry doors all work basically the same way. If you are changing out the knob and lock to a similar style, it is a fairly simple installation with minimal (if any) cutting needed. Here are the steps for changing a standard locking door set. 1 – Remove the interior knob by unscrewing the two screws on either s ide of the back plate using a screwdriver. 2 – Gently pull the two knobs apart. 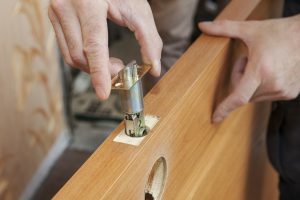 3 – Remove the latch plate on the edge of the door by removing the two screws that hold it in place. Remove the plate and the lock assembling by pulling it straight out. If it is stuck, put your screwdriver behind the latch and holding each side pull the screwdriver towards you. 4 – Check the new strike plate for fit. If needed, use a chisel to remove wood so the plate lays flush. 5 – Making sure the keyed side is to the outside, insert the new lockset through the holes. 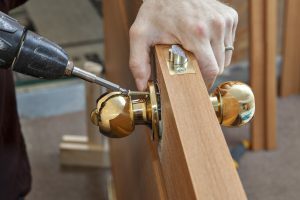 6 – Place the knob assembly through the door carefully aligning the shafts. 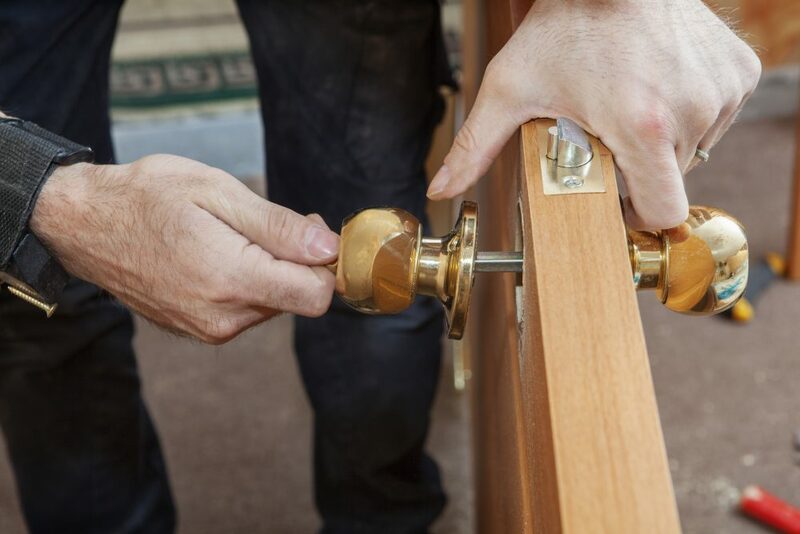 7 – Test the latch operation by locking and unlocking the door before installing the screws. 8 – Install the screws on the backplate being careful not to strip the screws by over tightening. If the door has a deadbolt, it is replaced just as the knob was replaced. The plate on most deadbolt key covers must be removed with an Allen wrench.